5 Bedroom Detached House For Sale in Bedford for £795,000. Featured In The Big Open House ! Walnut Tree Farm is an impressive five bedroom detached property, which is located in the popular village of Keysoe and offers over 2000 sq.ft of accommodation and separate outbuildings. The property was built by the current owners and offers 5.5 acres (STS). with the added benefit of solar panels. The ground floor offers a large versatile living accommodation which includes, dual aspect living room with feature fireplace, formal dining room, the main room of the house is the large kitchen-diner with the snug attached, leading off the kitchen you have a utility room and conservatory. There is a further study which can also be used as a bedroom and shower room. The master bedroom, with en-suite, has wardrobes spanning one wall. Bedroom two is dual-aspect. Bedroom three and four are also double bedrooms. The family bathroom serves the three bedrooms. There are numerous outbuildings offering a variety of uses. The main outbuilding consists of 5 large stables, a number of smaller enclosures used as pony stables, goat/sheep/poultry pens and storage. There is a large tack room/workshop with WC and hot water. There is also a large hen house, a big hay barn and 2 further stables attached to this barn. Lastly there is a double garage. The whole plot is estimated at 5.5 acres (STS). There is a private garden which is fenced off for the main house. The rest of the land is used mainly for horses and has a separate mnage. 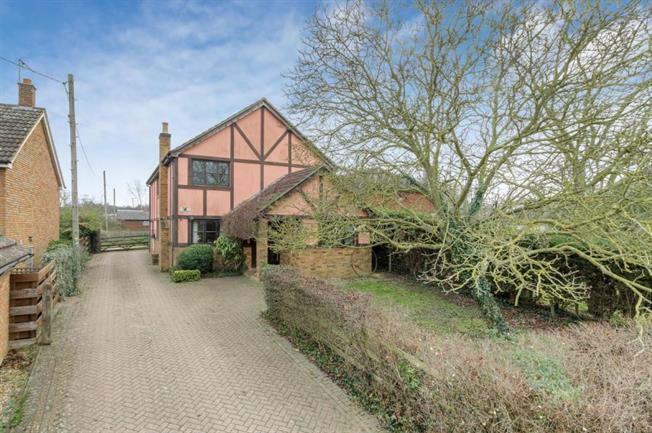 Keysoe is a picturesque village located in north Bedfordshire Keysoe has a very large and well respected Equestrian College, St Mary's church which is very beautiful and a public house, it is also an active community with a pre school and primary school. The village is within a short drive to Kimbolton, a very pretty and well served village with a large Budgens, Within easy reach are excellent independent schools run by the Harper Trust in Bedford and Kimbolton School. Bedford Station is 11 miles away with regular trains to London. The property is in easy reach of Rushden Lakes Shopping Centre, which offers first class shopping with lakeside restaurants and cafes.